All trematode species that are parasitic for humans are digenetic. Sexual reproduction in the adult fluke is followed by asexual multiplication in the larval stage. Most species of adult trematodes have an oral and ventral sucker. The life cycles of trematodes that are important human pathogens are similar among all five major species. Eggs are excreted in the feces of the host, hatch in fresh water, and require a primary host in snails before infection occurs in humans. 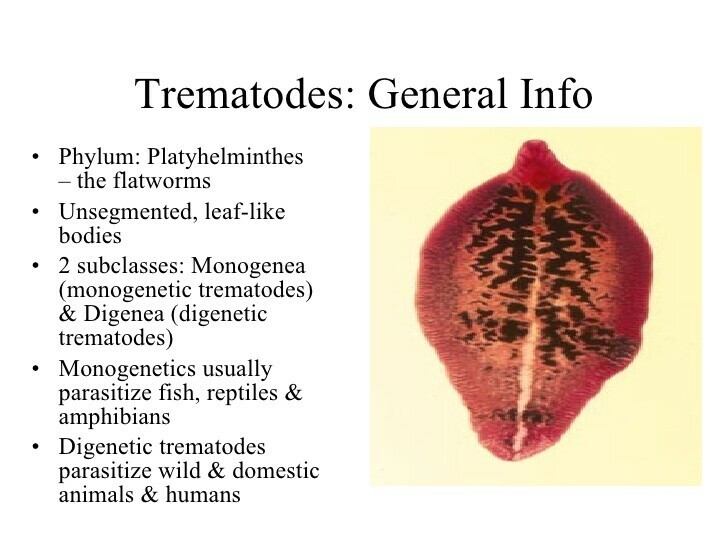 Trematode infection may be classified into four general groups based on the final habitat of the adult flukes in humans as follows: blood flukes, liver flukes, intestinal flukes, and lung flukes (Table 1). The final habitat for blood flukes is the venous system of the bowel mesentery or the urinary bladder. It is estimated that schistosomiasis occurs in > 200 million people worldwide and is endemic in Asia, Africa, South America, and other parts of the world where the population is engaged in freshwater agriculture. The total number of infected individuals in the United States is estimated to exceed 500,000, and these cases are most often in immigrants from South America, Asia, and the Caribbean. The disease cannot spread in the United States because the specific snail that serves as an intermediate host does not yet exist in the United States. Unlike most other trematodes that are pathogenic for humans, adult schistosomes have separate sexes. The female fluke resides within a groove created by the fold of the lateral edges of the male fluke. Each of the five blood fluke species that are pathogenic for humans has a specific geographic distribution as follows: Schistosoma mansoni, Arabian peninsula, Africa, Caribbean, and South America; Schistosoma haematobium, Middle East and Africa; Schistosoma japonicum, Japan, China, and The Philippines; Schistosoma mekongi, Southeast Asia; and Schistosoma intercalatum, west and central Africa. The specific geographic distribution depends on the presence of the specific snail intermediate host. 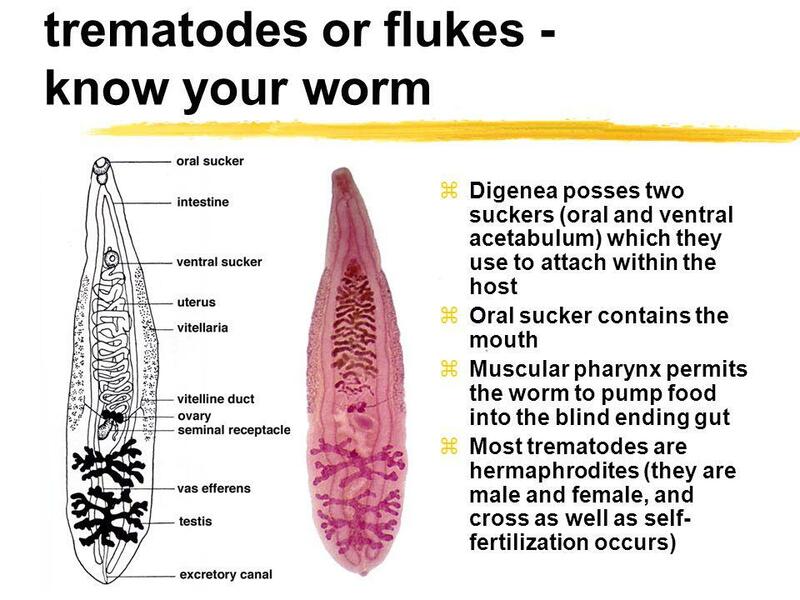 The life cycle of the five major species of blood flukes is as follows: adult flukes (1-2 cm in length) inhabit the venous system of the mesentery or urinary bladder; sexual reproduction results in the characteristically shaped eggs that are excreted in the feces; the eggs hatch in fresh water, releasing ciliated motile miracidia, which penetrate the body of the snail that serves as the intermediate host (a specific snail and geographic distribution exist for each species of blood fluke); within the snail, the miracidia multiply asexually and, 4-6 weeks later, hundreds of fork-tailed cercariae emerge; the cercariae penetrate human skin, lose their tails, and become schistosomes that migrate to the lungs and liver where maturation occurs; and ~ 6 weeks later, the mature adult fluke migrates to its final habitat in the venous systems. The mean life span of adult flukes in humans is estimated to be 5-10 years. The three different stages (cercariae, mature flukes, and eggs) of the blood fluke in humans result in three major disease syndromes in chronologic order: dermatitis (swimmers' itch), fever and constitutional complaints (Katayama fever), and finally chronic fibro-obstructive disease (Box 88-1). Dermatitis (swimmers' itch) is the acute form of schistosomiasis and is characterized by a pruritic and papular rash that usually occurs within 1-3 days after penetration of the cercariae. Swimmers' itch rarely occurs after primary exposure and is more common in individuals who have been sensitized by earlier exposure. Katayama fever occurs 4-8 weeks after penetration of the skin in humans and coincides with the production of eggs by the flukes. Katayama fever is most severe after S japonicum infection, but occasionally occurs in patients infected with S mansoni and rarely S haematobium. Patients experience an acute onset of fever, chills, headache, and cough. Physical findings often include lymphadenopathy and hepatosplenomegaly. Eosinophilia is common. Symptoms usually disappear within a few weeks after onset, but, rarely, death may occur, usually in association with S japonicum infection. Katayama fever may be the result of immune complex formation from massive antigenic challenge from exposure to fluke eggs. In chronic fibro-obstructive schistosomiasis, tissue damage occurs from chronic inflammatory response to the deposition of eggs. This results in chronic granulomatous disease and eventual fibrosis. Liver and bowel are the sites most commonly affected in patients with infection caused by S mansoni, S japonicum, S mekongi, or S intercalatum. Patients often experience chronic abdominal pain and diarrhea. In the liver, fibrosis may result in portal hypertension, hepatosplenomegaly, esophageal varices, and variceal bleeding. Liver function tests usually remain normal for an extended period of time after infection. In chronic untreated cases, hepatic dysfunction, jaundice, ascites, and liver failure may occur. In patients with S haematobium infection, the flukes are located in the vesicular plexus, and granulomatous formation occurs in the bladder and ureters. Hematuria is the most common complaint. With prolonged infection, fibrosis, ureteral obstruction, and chronic renal failure may occur. The frequency of bladder cancer may be higher in patients with chronic S haematobium infection. Pulmonary schistosomiasis may occur in patients with advanced liver cirrhosis and portal hypertension. The development of portosystemic shunts enables fluke eggs to bypass the liver and enter the pulmonary circulation. Patients with S haematobium may also develop pulmonary schistosomiasis; the eggs may enter the inferior vena cava from the vesicular plexus and enter the pulmonary venous system. Of patients with S japonicum, ~ 3% develop central nervous system schistosomiasis manifested by space-occupying lesions that may cause focal seizures. Rarely, granulomatous lesions resulting from ectopic eggs in the vasculature of the spinal cord may cause transverse myelitis. The most common laboratory findings seen in patients with schistosomiasis include eosinophilia, hematuria, anemia, and — in chronic end-stage infection — abnormal liver function tests, elevated serum creatinine, and uremia. The diagnosis is established by identifying the characteristic schistosomal eggs in the feces, urine, or a rectal biopsy specimen. Skin tests or serologic tests are helpful for epidemiologic studies but are not diagnostic of active infection. Hepatic schistosomiasis may resemble any process that causes chronic hepatosplenomegaly and portal hypertension including alcoholic cirrhosis, Wilson's disease, chronic hepatitis C infection, and many other conditions. S haematobium must be differentiated from bladder or ureteral cancer, reflux disease, and other syndromes that cause hematuria or chronic renal failure. The treatment for patients with schistosomiasis is shown in Box 88-2. Praziquantel is safe and effective therapy for all five species of schistosoma that infect humans. Eggs may be shed for some time after treatment, and follow-up stool or urine examination should be obtained several months after therapy to ensure eradication. The prognosis of schistosomiasis is excellent among patients who are treated before end-stage hepatic or renal disease develops. In these patients, prognosis depends on the magnitude of end-organ disease. The only effective means of prevention is to avoid contact with fresh water in areas where schistosomiasis is endemic. The final common habitat for the liver flukes is the bile ducts. The liver flukes that are the most common cause of human infections are Clonorchis sinensis (clonorchiasis), Opisthorchis spp. (opisthorchiasis), and Fasciola hepatica (fascioliasis). C sinensis (Chinese or oriental liver fluke) is a flat, elongated fluke (~ 15 mm ( 3 mm) that inhabits the distal biliary capillaries. Humans are incidental hosts, and the infection is endemic in China, Hong Kong, Korea, and Southeast Asia. Eggs eliminated in the feces are then ingested by the specific snail intermediate host. After ingestion, the eggs hatch into miracidia. The organisms multiply and produce extremely high numbers of cercariae that exit the snail and penetrate the skin of freshwater fish. Once the cercariae are on the fish skin, they encyst as metacercariae, which are infective for humans. Humans and fish-eating mammals acquire infection by ingestion of raw or undercooked fish that contain metacercariae. After ingestion, metacercariae excyst in the duodenum of humans and pass through the ampulla of Vater, where the flukes mature into adults in the bile ducts. O felineus and other species are endemic in Southeast Asia, Eastern Europe, and Russia and are common liver flukes of dogs and cats that may be transmitted to humans. The life cycle is similar to that of C sinensis. F hepatica is a common liver fluke in sheep and cattle and is endemic in South America, Europe, Africa, Australia, and China. Humans are incidental hosts. Eggs are deposited in the biliary system and excreted in the feces. In fresh water, the eggs hatch, and the miracidia must reach and penetrate their specific snail host within 8 h. The cercariae emerge from snails and encyst on aquatic plants and sometimes in soil. The plants are consumed by humans, sheep, or cattle. The organisms excyst in the duodenum. The larvae penetrate through the intestinal wall into the peritoneum, enter through the capsule of the liver, and migrate to the bile ducts. The majority of patients with C sinensis and O felineus infections are asymptomatic (Box 1). With heavy infection, biliary obstruction and cholangitis may occur. The frequency of cholangiocarcinoma may be increased in patients with chronic C sinensis infection. Diagnosis depends on demonstration of the characteristic eggs in the feces. Unlike clonorchiasis or opisthorchiasis, patients parasitized by F hepatica are usually symptomatic, and there are two distinct clinical stages of infection. In the early stage, symptoms correspond to the hepatic migration of the larvae, and patients experience fever, right upper quadrant pain, hepatomegaly, and eosinophilia. Acute symptoms subside as the larvae enter the bile ducts, and most patients become asymptomatic in this later stage of infestation. Biliary obstruction, cholangitis, or biliary cirrhosis may occur rarely with heavy infestation. The definitive diagnosis is made by identifying the characteristic eggs in the feces or bile. A positive serologic test suggests infection. Computed tomography of the liver may show small nodules and tortuous tracts made by the migrating larvae. In the acute phase of F hepatica infection, patients may resemble those with acute cholangitis, cholecystitis, liver abscess, or Neisseria gonorrhoeae infection (Fitz-Hugh and Curtis syndrome). However, the presence of eosinophilia suggests F hepatica infection. Praziquantel is effective therapy for symptomatic patients with C sinensis or O felineus infection. Bithionol is the drug of choice for F hepatica infection (Box 2). The prognosis for treated patients with liver fluke infection is excellent. Avoiding consumption of raw or undercooked freshwater fish is the only effective means of prevention of C sinensis or O felineus infection. Individuals should avoid consumption of undercooked aquatic plants and grasses in areas where F hepatica is endemic. The final habitat of intestinal flukes is the small bowel. Fasciolopsis buski is endemic in the Far East and southeast Asia. Eggs are excreted in the feces, develop into cercariae in fresh water, and encyst on freshwater plants. 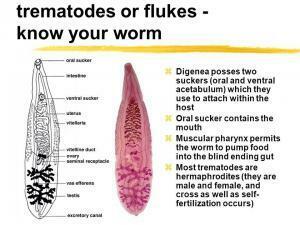 After human consumption, the organisms excyst in the bowel and mature into adult flukes that measure 2-8 cm ( 1-2 mm. They reside in the upper portion of the small intestine where they attach to the mucosa. Most patients are asymptomatic, but, with heavy infection, abdominal pain, diarrhea, and occasionally malabsorption may occur (Box 1). Diagnosis may be made by the demonstration of the characteristic eggs or adult flukes in the stool. Most patients are asymptomatic, and the differential diagnosis is that of patients with diarrhea and abdominal pain caused by bacteria and other parasites. Praziquantel is effective therapy for intestinal flukes (Box 2). Individuals residing in endemic areas should avoid consumption of undercooked aquatic plants and grasses. Paragonimus westermani is endemic in the Far East Indian subcontinent, Central and South America, and West Africa. Human lung flukes produce eggs in sputum that are swallowed, excreted in the feces, and mature in fresh water into miracidia, which penetrate snails. The mature cercariae exit the snail, penetrate into freshwater crayfish and crabs, and encyst. Infection in humans occurs after ingestion of raw, undercooked, or pickled freshwater crustacea. After ingestion, the organisms excyst in the duodenum, penetrate through the bowel wall, enter the peritoneal cavity, pass through the diaphragm into the pleural space, and enter the lungs where they mature into flukes that measure 7-15 mm ( 5-8 mm. Ectopic eggs in the brain may result in space-occupying lesions and focal seizures. Many patients with minimal to moderate infection are asymptomatic (Box 88-1). With acute infections, symptomatic patients experience cough productive of brown sputum or hemoptysis and eosinophilia. Heavy untreated infection may progress to chronic bronchitis or bronchiectasis with large-volume sputum production, pleuritic chest pain, pleural effusion, and lung abscess. Diagnosis is made by identifying the characteristic eggs in the sputum or feces. A positive serology may be helpful in the diagnosis of ectopic infection. The diagnosis should also be suspected in individuals who do not reside in endemic areas but have a history of consumption of undercooked crustacea imported from endemic areas. Pulmonary paragonimiasis resembles chronic bacterial infection, mycobacterial infection, or carcinoma of the lung. The presence of eosinophilia in these patients who reside in or have traveled to an endemic area should suggest the diagnosis of paragonimiasis. Praziquantel is effective therapy (Box 2). The prognosis is excellent in patients who are treated before the development of chronic bronchitis or bronchiectasis. Individuals should avoid the consumption of raw or undercooked freshwater crustacea from areas where P westermani is endemic. Table 1. Important trematodes parasitic for humans.